We’re proud to present the official Outlook Festival 2016 NYC launch party. Since 2008, Outlook Festival has provided a unique experience to fans of sound system music in all its forms. Set amid the beaches and abandoned fort of Punta Cristo, Croatia, Outlook Festival has played host to hundreds of artists over the years and was voted Best Overseas Festival at the 2011 UK Festival Awards. For this year’s US east coast launch party, which joins a list of worldwide events held in the months leading up to the festival in early September, Outlook has teamed up with us and our bespoke 15,000-watt wooden sound system, The Tower of Sound, for an event of bass shaking proportions on Friday May 20th at the Paperbox in Brooklyn. The official Outlook Festival 2016 NYC Launch Party is headlined by a musical clash between two of Europe’s best known sound system champions: Glasgow’s Mungo’s Hi Fi and the French-Swiss O.B.F. In the fine tradition of sound system clashes, the two will face off on the Tower of Sound with short rounds of dubplates and assorted sonic weapons to win the hearts and minds of the crowd. Accompanying this clash will be a selection of international vocalists representing all eras of the music including Jamaica’s Ranking Joe, France’s Shanti D, and Brooklyn’s Jay Spaker. Expect true vibes in what is sure to be New York City’s most memorable sound system event of 2016. Supporting this international clash in The Paperbox’s main room will be Portland’s E3, founder of the acclaimed ZamZam Sounds label, local selectors Scratch Famous (Deadly Dragon Sound) and Dub-Stuy’s resident DJs. The party doesn’t here, however. To give local audiences a taste of Outlook Festival’s wide ranging line-up, We’re opening the second room of The Paperbox and fitting it with T-Gees Sound System. Handling selection duties all night is a line up of renowned local New York selectors and crews including Dave Q (Dub War), Star Eyes (Trouble & Bass, Chaos Clan), Vik Rai (Reconstrvct), Doctor Jeep (Trouble & Bass, Chaos Clan) Etch (flying in from England), Earthtone, and the Maro. 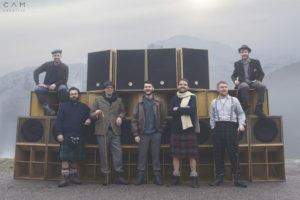 Mungo’s Hi Fi are a Glasgow-based sound system and production unit founded at the turn of the millennium by two like-minded DJs and inspired by King Tubby, Prince Jammy, and the UK’s Unity Sounds. Since then, Mungo’s has become a by-word for quality and original dancehall and reggae in the United Kingdom and abroad. True to the DIY ethos of the music they loved, Mungo’s built their first sound system from speakers found in a skip and began making tunes on an old Atari computer. Early parties featured visiting vocalists who would also join the crew in the study. Mungo’s founded their own Scotch Bonnet imprint in 2005, following a debut album on London’s Dubhead records. 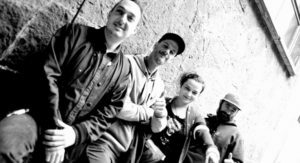 Today Mungo’s is a global operation with six members, all committed to spreading their philosophy of serious, seismic productions plus easy going democratic dancehall fun. Highly collaborative, they’ve worked with everyone from Sugar Minott and Ranking Joe in Jamaica to Major Lazer in America, Kenny Knots and Solo Banton in England, and Scotland’s Soom T. Their discography includes five albums, each featuring a talented cast of guests and combining a keen sense of history with a wicked creative streak and some industrial strength drums and bass. Like their inspirations, Mungo’s believe in testing their music where it matters: at their hugely popular parties and events worldwide. A sound system, a production house and a unique way of doing things – Mungo’s Hi Fi are always looking for new collaborators and people who share their vision of taking music more seriously than yourself and pushing forward while never forgetting where you’re from. Since their beginning in the early 2000s, O.B.F (Original Bass Foundation) have become one of the most in-demand sound system of the international dub scene. Based between Paris, France, and Geneva, Switzerland, where they organize their own Dubquake and Top Ranking parties, the crew is equally known for the quality of their productions as for their ability to orchestrate dances of a rare intensity. Following a string of EP releases since 2010 on their Dubquake and O.B.F imprints, alongside collaborations with High Tone, Chinese Man, and Vibronics, the O.B.F crew released their debut album, Wild, in 2014. The album features vocal appearances from YT, Charlie P, Shanti D, and Mikey General among others.